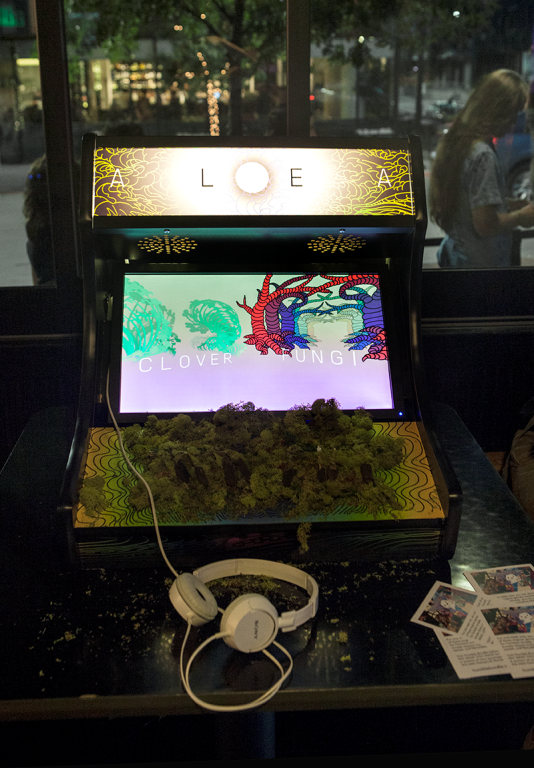 Perhaps the most innovative and interesting game was Alea, a psychedelic hiking simulator designed by Paloma Dawkins and Cale Bradbury using organic materials as part of the hardware. Alea's gameplay centers on the tension of playing with controllers that are actively deteriorating before the player's eyes. The creators placed real moss over the flex sensors, which began to degrade and die through use as the installation went on. According to Cale Bradbury, the controllers were inspired by William S. Burroughs' Naked Lunch "where [the character] became one with his typewriter" and described the destruction of the moss as "mirroring how people treat nature." Paloma Dawkins remarked that "tech and nature just don’t really go together. Right now, the controllers are getting destroyed and people are frustrated because it’s just so different." The gameplay replicates a particular hiking experience of Dawkins’ while shedding light on the tense and often antagonistic relationship between technological modernity and nature. I was struck by the juxtaposition of a soft plant surface and the technology with which it was integrated, and by the fact that the man-made controller was gradually revealed as the moss degraded through play. Fantastic Arcade's games begged to be touched, hit, smacked, and explored; but the beauty of Alea was that the more it was played, the more the controllers that facilitate play fell apart. The game anticipated—even invited—its own destruction. 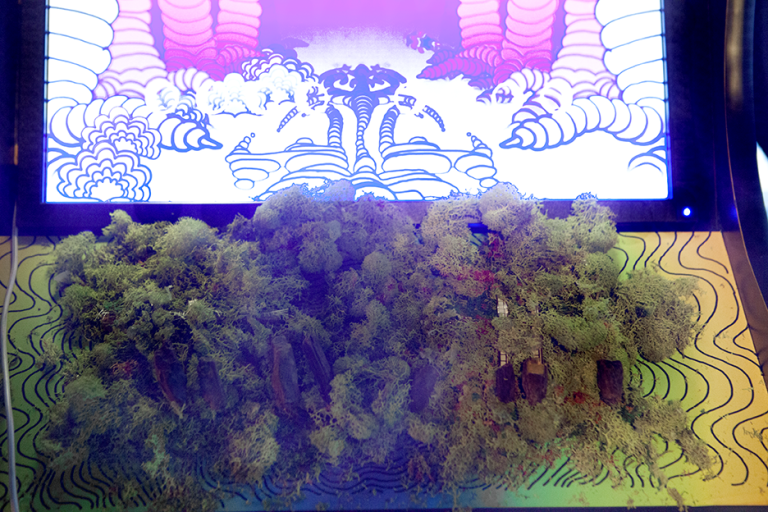 As a game, Alea features different levels of colorful, '70s-styleforest, with branches that move according to the rhythm of the player touching the moss controllers. The pace is set by laidback rock and electronica music in the background. 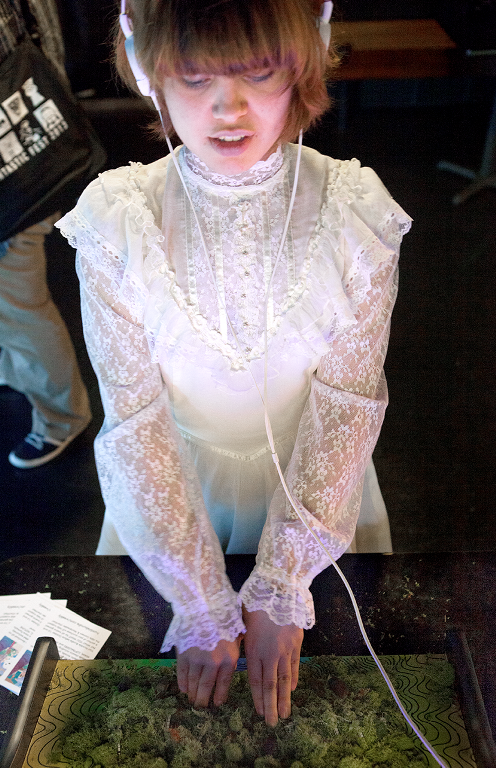 Alea was inspired by both Bradbury's interest in net art and a particular trip Dawkins took to the Muir Redwoods Forest. Dawkins, an illustrator and videogame designer, conceived of the game after reflecting on the difference between her and her companions' behavior while hiking: while they moved quickly through the woods, Dawkins fell behind, distracted by the beauty of the trees. "I was trying to keep up… [but] it was such a weird sensation of trying to not fall …and trying to have a connection to where you are," she said. The rhythm of the gameplay reflects the tension Dawkins experienced on her hike: wanting to take in the surrounding beauty while trying to keep pace all the beats and animations are deliberately programmed pattern loops that repeat over and over, providing a meditative experience for the player. Of the games I tried at Arcade, Alea did the most to push the boundaries of thematic concepts within gaming. It felt refreshingly earnest and thoughtful, and I hope to see more games that blur the lines between interactive art and gameplay—a rich and under-explored territory within the indie games scene. Alea is a rewarding step in that direction.